BERLIN, Sept. 23 (Xinhua) -- Chinese exhibitors have impressed Europeans at recent exhibitions held separately in Germany and Montenegro with sharp-edged and innovative products and services. "China's role in the world is shifting from a follower to a leader" in industrial innovation, one of the exhibitors said, adding that Chinese manufacturers have become the first ones to apply brand new technologies now rather than only use mature technologies and products as they did in the past. The number of Chinese exhibitors at InnoTrans, the railway industry trade fair, has been growing steadily for years, said Matthias Steckmann, senior vice president of the bi-annual fair, which was held on Sept. 18-21 in Berlin. Around 180 Chinese exhibitors, with a total exhibiting area of more than 6,000 square meters, attended the fair, Steckmann told Xinhua, saying "This is reflected in the growing importance of China's mobility industry, not just at InnoTrans." This year, 3,062 exhibitors from 61 countries and regions with more than 400 new products showed up at the Berlin Exhibition Grounds. "We look forward to the Chinese mobility industry's growing participation in InnoTrans," Steckmann said. Besides InnoTrans, more than 200 Chinese companies have attended the eight-day 67th IAA Commercial Vehicles starting from Thursday in the German city of Hanover. The bi-annual trade fair draws 2,174 exhibitors from around 48 countries and regions. In total, exhibitors debut 435 global models for the commercial vehicle sector, a record figure for the IAA, on an area of 282,000 square meters. With China as the partner country, the 40th Civil Engineering Fair opened on Wednesday at the ground of the Adriatic Fair, together with the 13th Water Supply Systems and Sanitary Technologies Fair and the 6th Energy Fair. Seven Chinese companies, including the China Civil Engineering Construction Corporation (CCECC) and the China Road and Bridge Corporation (CRBC), participated in these fairs. Rajko Bujkovic, executive manager of the Adriatic Fair, told Xinhua that in regard to the partner country status, Chinese companies have greater visibility at the fair that represents a "business gate of Montenegro." Chinese companies not only have strong presence at European fairs, but also in European markets. 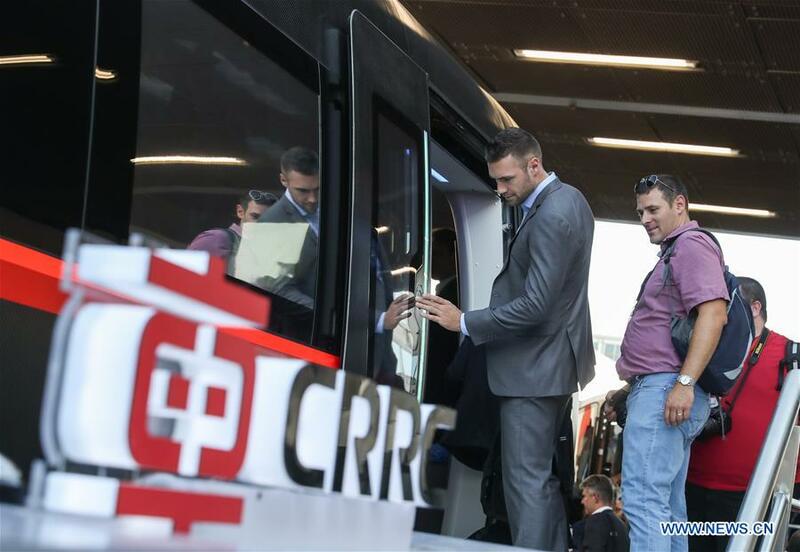 CRRC Zhuzhou Locomotive (CRRC ZELC), a China-based company in the rail industry, unveiled at InnoTrans the shunting locomotive specially customized for German rail service provider Deutsche Bahn (DB). The locomotive will be delivered directly to Germany Hamburg depot after the fair. "This is a typical green product with new technology, new material, new process and new structure," said Sun Yongcai, CEO of CRRC Corporation Limited, at the technology release conference of DB hybrid shunting locomotive. In Hanover, Faw Jiefang Automotive Co. Ltd Wuxi Diesel Engine Works (FAWDE), a Chinese diesel engine manufacturer, and Stuttgart-based Mahle, one of the largest automotive parts supplier in the world, released the application of Mahle MonoLite piston on FAWDE ALL-WIN 6DM3 Engine, which is the first application of a laser welded steel piston worldwide. China is an important market for diesel engine globally and the FAWDE is one of the market leaders, as well as an important partner, CEO of Mahle Joerg Stratmann said, on choosing the FAWDE as the first application partner of the new leading technology and product. "Looking forward, we can really see an exciting future that we can achieve together with our joint forces," Stratmann added. The CCECC finished the Kolasin-Kos railway rehabilitation project in Montenegro last year. According to Zhu Tianran, general director of CCECC Montenegro Ltd., the company has strong presence in the international market in the field of railway construction, its core business, and in road construction. The company has also shouldered its social responsibilities in countries where they operate. In Montenegro, besides providing products and services, Chinese projects also help boost employment in the long run. Bujkovic explained that due to infrastructure projects such as Bar-Boljare highway, employment of Montenegrin companies as contractors enables them to employ their existing capacities as well as gain fresh know-how. In the meantime, Chinese high-quality products are distributed to the local market by Montenegrin companies. "The CCECC aims to show its strength and experience, to expand its influence and to attract potential local partners, creating conditions for more participation in infrastructural projects in the Balkan area," Zhu said. The technology and competitiveness of China's rail transit enterprises are constantly improving, said Wang Weidong, commercial counselor of the Chinese Embassy in Germany. "Compared with developed countries, many rail transit products in China have (their) own advantages in technology and cost, and they have very strong competitiveness," Wang said at InnoTrans. Chinese tech giant Huawei's CloudMetro solution, which recently passed rigorous testing by the European Advanced Networking Test Center (EANTC), shows itself to European visitors in Berlin. "We evaluated a wide range of functions of Huawei's CloudMetro solution. We can confirm that Huawei's 5G transport series products are getting ready to meet the challenges of metro network cloudification. Huawei's support in the ultra-broadband sector, in slicing, in the evolution from MPLS to next-generation transport, and in the management and analysis functions is really great," said Carsten Rossenhoevel, CTO of EANTC. On cooperation with Huawei, Soeren Link, mayor of Duisburg, said, "there have been lots of exciting projects during the process of working with Huawei which inspired us in our work. Duisburg already has a tight connection with China. Through the cooperation with Huawei, such partnership with China grows even stronger." As the exhibition organizer, Bujkovic said that Chinese companies are highly competitive thanks to the technology they are offering, "which is far superior to that used in Montenegro, as well as in the global market." "The potentials of Chinese companies are immense, while their opportunities are great, as they are already present at the market and additionally represent ongoing projects, which is a great opportunity for them to gain recommendation for future projects," said Bujkovic. Meanwhile, representatives of Montenegrin companies see Chinese companies as reliable, experienced, competitive and technologically advanced. Dragan Markovic, official of the public enterprise for coastal zone management, told Xinhua that his company invests millions of euros in infrastructural works and welcomes companies from all sides to compete. "Chinese companies are already present at this market through the capital infrastructure projects they are engaged in, which are both of immense importance to them as well as their Montenegrin partners. They are also welcome to participate in smaller projects with their technology and know-how," Markovic said. Momcilo Stojanovic, member of the award jury for the best presentation of the fair, told Xinhua that he saw Chinese companies as "highly professional." "They are very serious and I am not surprised because of the comprehensive and fast expansion of the Chinese model of economy in Montenegro, Europe and the whole world," he said. Speaking of the potentials for Chinese companies, he said that China is among the most technologically advanced countries in the world, and that the realization of projects of its companies in Montenegro is impressive.